Harrison Maddox is among a growing number of Rock Region METRO riders who combine their enthusiasm for cycling with their support of public transportation. He also is among a handful of people selected to help launch the agency’s METROtrack app that tells where a particular bus is at any given moment. Harrison was one of the “beta testers” – volunteers who had early access to the app to find, and iron out, any kinks in the system. 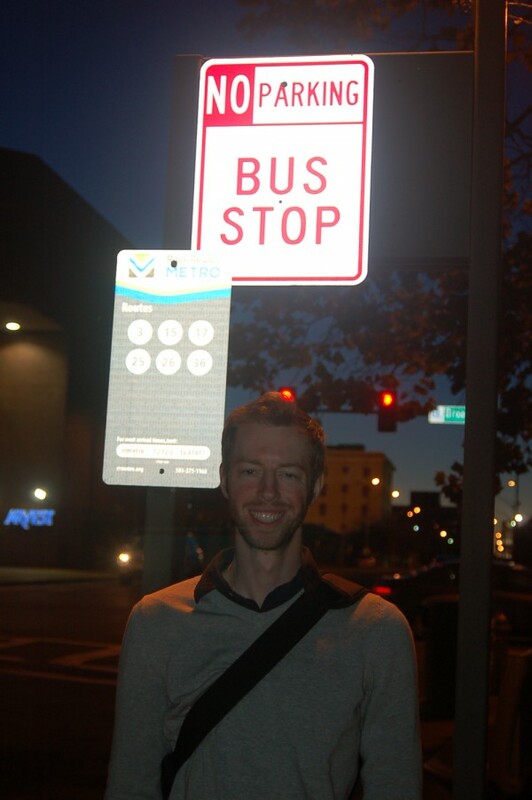 “This is an incredible asset for people to know exactly when they should be at a bus stop,” he says. Maddox, 28, is a copywriter for Aristotle, the high-tech communications giant based in the Simmons National Bank tower in downtown Little Rock. He rides his bicycle to work nearly every day from his home in the Riverdale area along old Cantrell Road, but a half dozen or so times a month he will use the bike racks on the front of Rock Region METRO buses to get out to west Little Rock to shop and run other errands. He does the same on buses that run along south University Avenue. “The bus-bike combination is a great way to expand my range,” says Maddox, who has been using the transit service regularly for about five years. Along with the bus racks, Maddox has seen other improvements to services, particularly the various ways riders can purchase bus passes. More routes and more buses at night would be appreciated, he says. “All great cities have great public transit systems,: he says.